One mightbe excused for wondering what, exactly, German director Roland Emmerich has againstthe United States.After all, his films (such as ?Independence Day? and ?The Day AfterTomorrow?) famously show American icons such as the White House and theStatue of Liberty being destroyed. 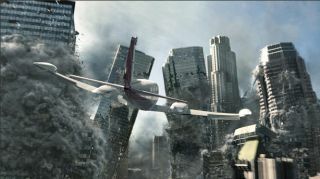 With his new film ?2012?,Emmerich upsthe ante, depicting a global disaster caused by terrestrial instability. JohnCusack stars as Jackson Curtis, a LosAngeles writer whose failed novel broke up his marriage.Jackson wantsto reunite with his family, and ends up going (almost literally) to the ends ofthe earth to save them. At the same time in WashingtonD.C., the president?s chiefscience advisor discovers an impending danger in the Earth?s unsettled tectonicplates. He butts heads with the chief of staff over when the information shouldbe made public, and who they should tell first. The filmtackles a variety of weighty questions, such as: If the end of the world wascoming, what would you do? If only the government knew, who should be told? Ifthere was a way that some people could survive, who should decide who lives andwho dies? In the caseof a true global catastrophe, is there really any point to announcing it to theworld? Put simply, if everyone?s gonna die in 36 hours and there?s nothing anyone can do,what?s the point in telling people? Assuming you had perfect knowledge, whybother? Some people would panic, others wouldn?t believe it anyway, and otherswould try to write and market their book on it overnight. These areinteresting questions, but unfortunately get lost amid the film?s shouting andexplosions and crashes. About a half dozen subplots appear, several of themawkwardly aborted in the rush to get to the disaster scenes. Then thereare the implausibilities ?and I?m not even talking about LosAngeles sliding into the ocean in such a cinematicfashion. Jackson Curtis has more lives than James Bond and Indiana Jones puttogether, as he literally outruns fireballs and earthquakes, saving the daywith each step. But my favorite eye-roller is when almost the entire world hasbeen consumed by fire and flood ? except, apparently, the parts that allow alast-minute cell phone call so that two lead characters can share one lastscene together. But tocriticize a disaster film for being implausible is itself a bit silly. Peopledon?t go to disaster movies to see rich emotional tapestry or ?Memento?-likeairtight logic; they go to see stuff get blowed up. And on that level, itsucceeds. Destroyingthe world is not easy, and the filmmakers used a variety of special effectstechniques to bring global disaster to the big screen. From a visual effectsstandpoint alone, ?2012? is a remarkable achievement. The actors were often onmoving sets ? none of that cheesy original ?Star Trek? technique of throwingactors to the floor while shaking the camera to simulate explosion concussions.In many of the scenes, the objects are actually collapsing around the actors,as giant gimbals and hydraulic lifts jostle and jolt the sets. Some of thescenes are remarkably effective (a shot of a giant wave overtaking a cruiseship is genuinely chilling, reminding me of ?The Perfect Storm? ), while othersjust look like a cartoony video game. The film isbasically a retelling of the Noah?s Arkflood story, and has nothing to do with the date 2012. It could have been setin 1995 or 2013, but the 2012 angle made a perfect hook for the film: Why nottie it in with the supposed end of the world, allegedly tied to the end of theMayan calendar in 2012? Notsurprisingly, Columbia Pictures is taking full advantage of the New Agey 2012 doomsdaydiscussion/panic/concern to help promote the film. Over the past year or so,many people have suggested that the year 2012 will bring some sort ofsignificant change, either catastrophicdisaster (as in the film) or perhaps a new age of enlightenment (as in whatdid not happen with the so-called Harmonic Convergence in 1987). The linkbetween global catastrophe and Mayan calendar-based prophecy is tenuous atbest. Some ads for the ?2012? film begin with the phrase ?The Mayans warnedus,? though of course the Mayans did not ?warn? anyone?they simply had acalendar system that happens to ?end? in 2012, much as our Gregorian calendar?ends? on December 31. The Mayans never said the world would end that year, andhave shown irritation and contempt for the way that their culture has beenco-opted into pop culture notions and Hollywoodblockbuster film promotions. New Age anddoomsday authors have been cranking out 2012-themed books at an amazing paceover the past six months; there are literally tens of thousands of such titlesin print, with more hitting the bookstores every day. It seems that anyone withaccess to a keyboard and an opinion on 2012 (or prophecy in general) is outthere tryingto cash in. It will be interesting to see how many of those will be forsale on Amazon.com for one cent on January 1, 2013. Iinterviewed director and cast of ?2012? for LiveScience.com; you can seethe videosof the interviews at Newsarama. Of particular interest is my interview withChiwetel Ejiofor, in which hediscusses how his characterstruggles to maintain scientific integrity in the face of political influences.After the Bush administration?s well-publicized anti-science stance and overtattempts to bend scientific research for political ends, this point seemsespecially relevant. Though2012 is not a great film, it does have some interesting pro-science aspectsthat skeptics and science folks should take note of. While John Cusack is thelead star, the hero of the film is really a black scientist, Adrian Helmsley (Chiwetel Ejiofor). Helmsley is thepresident?s chief science advisor, and it is he who first discovers theimpending danger. The film somewhat realistically portrays the difficulties ofscientific uncertainty?how sure do you have to be to sound the alarm? This isnot an academic question, and arises in discussions of scientific prediction ona wide range of topics ranging from asteroid impacts to global warming. Not only isthe scientist the hero, he is also the film?s major moral compass. There are noevil, white lab-coated scientists in ?2012?, there are only scientists doingtheir best to save humanity (and a few nerds thrown in for good measure). ?2012?is a completely humanistic disaster film; the catastrophes are not the work ofangry gods, nor magic spells,but nature itself. The film shows prayer failing miserably to stop thedestruction (even the Pope in the Vaticangets smacked away; Emmerichtold me he originally wanted to show Meccabeing destroyed, but didn?t want to risk a fatwa). In the end it isscience?hardworking, unglamorous science?that saves the day. These arewonderful, humanistic, pro-science depictions that I?d hope to see in morefilms; it?s a shame to see them buried amid so many CGI disasters andexplosions in ?2012?.